Dandruff is a fungal infection caused by Malassezia fungus. The fungus multiplies when the sebaceous glands release excessive fatty oil in the scalp. This leads to increase in cell turnover and peeling of dead cells on the scalp in the form of dandruff. 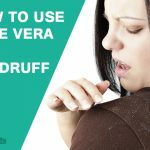 Dandruff is a very common condition found in both men and women. It deters us from wearing our favorite black dress as the white flakes are seen more prominently on a dark color. 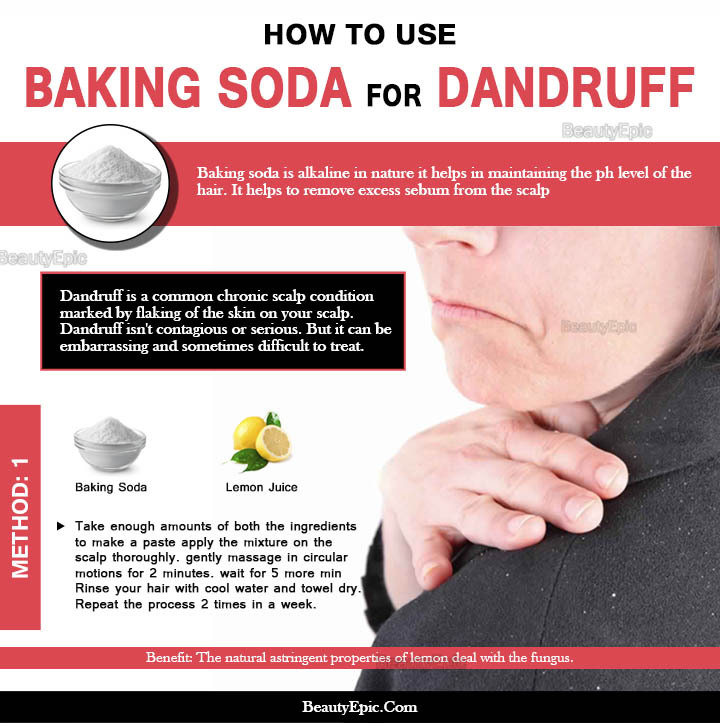 However a natural remedy like the baking soda can be used to cure dandruff at home. Below we have mentioned how to use baking soda for dandruff. Have a look! Does Baking Soda Remove Dandruff? It has been proven time and again that baking soda is very effective method of combating dandruff. It is cheap and easily available in the market. Baking powder acts as an absorbent and absorbs all the excess oil dead cell and dirt from the scalp. As baking soda is alkaline in nature it helps in maintaining the ph level of the hair. It helps to remove excess sebum from the scalp without allowing it to go dry. It acts as an oil and dirt removing shampoo and keeps the hair soft and shiny. There are various anti dandruff shampoos found in the super market that promise dandruff removal. However they also damage the hair. One can always consult the dermatologist for help. However using baking soda is a natural and easy method for dandruff removal which does not contain a large number of minerals either. This is the easiest method of using baking soda. Make a paste using rose water and baking soda. Gently massage this paste on your scalp for few minutes. The granules in the baking soda act like a scrub on the dandruff. This causes the dandruff and the dead cells to fall off. Rinse hair with cold water only. Note: Do not use a shampoo post this remedy. This method helps to remove excess oil, dirt and dead cells from the hair and scalp. Make a paste of lemon juice and baking soda and massage gently for a few minutes. Leave for 5 minutes and rinse with cold water. Repetitions: This should be done atleast twice a week. In case you want to use your herbal shampoo as well this is the best method for you. Mix a teaspoon of baking soda with any herbal shampoo in a bowl. Apply the shampoo and massage for few minutes. Rinse hair properly with cold water. Repetitions: Follow this process once or twice in a week. If you have apple cider vinegar in your home feel free to add it to baking soda for amazing results. Make a paste of apple cider vinegar and baking soda. Apply on scalp and massage gently. Repetitions: Repeat at least twice a week. Baking soda helps to get rid of the dandruff and beetroot kills the fungus and cleans the scalp. Make a paste of baking soda and water and apply on scalp. Also massage fresh beetroot juice on scalp and hair. Leave for few minutes and rinse with cold water. Repetitions: Repeat at least once a week. This leaves a smell of fresh mint in your hair. Apply a thick paste of baking soda and mint juice to the scalp. Leave for few minutes and massage gently. Rinse the hair with cold water. Repetitions: Repeat the above process once a week. Ginger is anti bacterial and will kill the fungus formation on scalp and will not allow dandruff to occur. Make a paste with baking soda, ginger juice and some water. Massage this paste on scalp and leave for few minutes before rinsing with cold water. Holy basil is both anti bacterial and anti fungal. Thus, it will not allow the growth of dandruff in your hair. Wash and blend 1 ½ cup of holy basil to make a smooth paste. Add a teaspoon of baking soda and apply on hair and scalp. 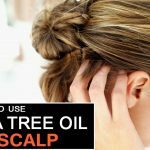 Though baking soda is very useful for cleansing the scalp yet there are certain things that should be kept in mind while using baking soda on the scalp. Baking soda should be used in small quantities and should not be left on the scalp for a long period of time. Also after application, hair and scalp should be rinsed properly so that there are no remains of baking soda. Avoid application of baking soda to any open wounds on scalp especially when combining with apple cider vinegar or lemon juice as it leads to skin irritation.